2. Anesthesiology and Perioperative Medicine, University of Louisville, Louisville, KY, USA. Study Design: A randomized, double-blind, active-controlled trial. Objective: To assess the effectiveness of cervical interlaminar epidural injections of local anesthetic with or without steroids for the management of axial or discogenic pain in patients without disc herniation, radiculitis, or facet joint pain. Summary of Background Data: Cervical discogenic pain without disc herniation is a common cause of suffering and disability in the adult population. Once conservative management has failed and facet joint pain has been excluded, cervical epidural injections may be considered as a management tool. Despite a paucity of evidence, cervical epidural injections are one of the most commonly performed nonsurgical interventions in the management of chronic axial or disc-related neck pain. Methods: One hundred and twenty patients without disc herniation or radiculitis and negative for facet joint pain as determined by means of controlled diagnostic medial branch blocks were randomly assigned to one of the 2 treatment groups. Group I patients received cervical interlaminar epidural injections of local anesthetic (lidocaine 0.5%, 5 mL), whereas Group II patients received 0.5% lidocaine, 4 mL, mixed with 1 mL or 6 mg of nonparticulate betamethasone. The primary outcome measure was ≥ 50% improvement in pain and function. Outcome assessments included numeric rating scale (NRS), Neck Disability Index (NDI), opioid intake, employment, and changes in weight. Results: Significant pain relief and functional improvement (≥ 50%) was present at the end of 2 years in 73% of patients receiving local anesthetic only and 70% receiving local anesthetic with steroids. In the successful group of patients, however, defined as consistent relief with 2 initial injections of at least 3 weeks, significant improvement was illustrated in 78% in the local anesthetic group and 75% in the local anesthetic with steroid group at the end of 2 years. The results reported at the one-year follow-up were sustained at the 2-year follow-up. Conclusions: Cervical interlaminar epidural injections with or without steroids may provide significant improvement in pain and functioning in patients with chronic discogenic or axial pain that is function-limiting and not related to facet joint pain. Keywords: Chronic neck pain, cervical discogenic pain, cervical axial pain, cervical disc herniation, cervical epidural injections, epidural steroids, local anesthetics. The State of U.S. Health: Burden of Diseases, Injuries, and Risk Factors  as published by the members of the U.S. Burden of Disease Collaboration showed that from 1990 to 2010, the United States made substantial progress in improving health, even though age-specific rates of years lived with disability remain stable. This report also showed that morbidity and chronic disability now account for nearly half of the U.S. health burden. Among the 30 leading diseases and injuries contributing to years lived with disability (YLD), low back pain was number one with neck pain occupying fourth place. Martin et al [2,3] evaluated health care expenditures for treatment of back and neck problems in the United States in 2005 and reported that these expenditures totaled approximately $86 billion, with an increase of 65% between 1997 and 2005 and a 49% increase in the number of patients seeking spine-related care. Studies of the prevalence of chronic neck pain and the impact it has on general health have shown that 14% of patients report Grade II to IV neck pain, with a high pain intensity leading to disability, with Grade 0 referring to no neck pain; Grade I representing pain of low intensity and few activity limitations; Grade II with neck pain of high intensity, but few activity limitations; Grade III with pain of high intensity and high levels of disability associated with moderate limitations in activities; and Grade IV referring to pain with high levels of disability and several activity limitations [4,5]. It is important to note that Grade III and IV pain with disability is seen in 5% of patients . In addition, chronic recurrent neck pain is a common problem in the adult population, with a typical 12-month prevalence of 30% to 50% [6-9]. Among the multiple presentations of neck pain and upper extremity pain, cervical radicular pain is a common condition leading to interventional techniques and surgery [6,10-34]. For patients without disc herniation, however, either related to discogenic pain from a degenerative disc or chemical irritation without facet joint pain, spondylosis, or spinal stenosis, the options are limited even though surgery and epidural injections are utilized in some cases [6,10,15-34]. Consequently, all modalities of treatments, including cervical spine surgery and cervical epidural injections, have risen dramatically over the past 2 decades [6,10,16-20,22,23,25-34]. Cervical interlaminar epidural injections have been applied only in recent years to manage chronic axial or discogenic pain without facet joint pain or radiculitis [6,10,15]. The increase of cervical epidural injections in the fee-for-service (FFS) Medicare population from 2000 to 2011 of 123% per 100,000 population lags behind cervical transforaminal epidural injections  with increases of 182%, 662% for lumbar facet joint neurolysis , 836% for cervical facet joint neurolysis , and 665% for lumbar transforaminal epidural injections . Axial neck pain may be related to either a disc or facet joint, spondylosis, or be musculoligamentous [6,9,21,24,25]. In general, cervical epidural injections are not recommended for axial neck pain, but they are considered to be reasonable for disc herniation with radiculitis and spinal stenosis [6,10-14,16-18,35-37]. 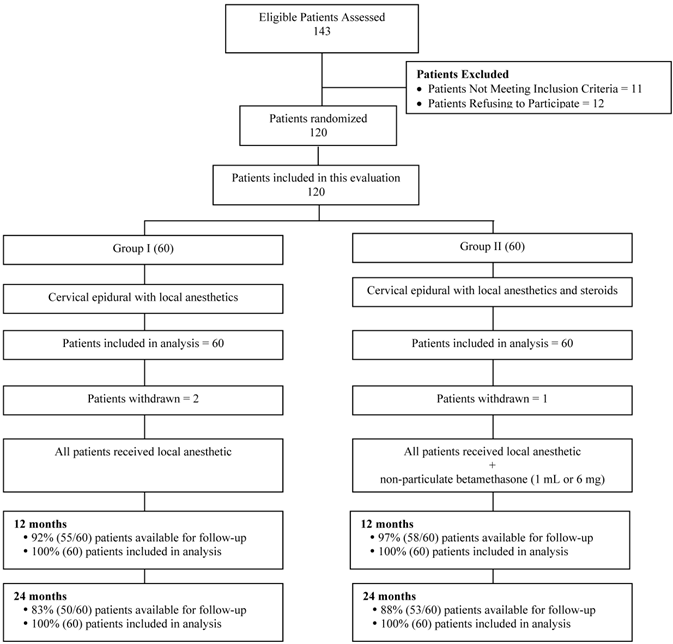 A single report of a one year follow-up of discogenic neck pain after excluding cervical facet joint pain in 120 patients without disc herniation or radiculitis showed a primary outcome of significant pain relief and improvement in functional status (≥ 50%) in 72% of patients in Group I receiving local anesthetic and 68% in Group II receiving local anesthetic and steroids. In patients considered to be successful, with at least 3 weeks of significant improvement with the first 2 procedures, the results were superior with 78% in Group I and 73% in Group II. Overall, this study showed better results in patients not receiving steroids in contrast to the results of disc herniation in the lumbar spine [38,39]. However, the results are similar to the treatment of disc herniation in the cervical spine [11,14] and lumbar discogenic pain [40-42] and superior to treatment of central spinal stenosis [12,43-45] and post-surgery syndrome [13,46]. In addition to epidural injections, multiple modalities of treatment are applied for axial neck pain including surgical interventions which are increasing rapidly along with other interventional techniques [16-34]. The primary goals of surgical intervention, however, are to relieve radiating arm pain in the case of radiculopathy and to prevent the progression of a neurological deficit in case of myelopathy [26,30]. Consequently, surgical interventions are focused on cases of radiculopathy, myelopathy, or a combination. Thus, although surgical interventions for discogenic pain are increasing rapidly, they fail to meet the fundamental premise, lack effectiveness, and are coupled with associated complications and off-label use of bone morphogenic protein [26-34]. This study has been designed to assess the effectiveness of cervical interlaminar epidural injections with local anesthetic with or without steroids in patients with axial neck pain after eliminating disc herniation, radiculitis, facet joint pain, and those suffering from chronic, function-limiting neck pain with or without upper extremity pain despite conservative management. This report consists of the results of 120 patients with a 2-year follow-up, and is a continuation of a previously published one-year follow-up report . The study was conducted in an interventional pain management referral center in the United States. The randomized, double-blind, active-control design based on Consolidated Standards of Reporting Trials (CONSORT) guidelines [47,48] was approved by the Institutional Review Board (IRB) and was also registered with the U.S. Clinical Trial Registry with an assignment number of NCT01071369. There was no external funding from any sources in conduct of this study. Only internal resources of the practice were utilized. A total of 120 patients were recruited to participate in this randomized, active-controlled, double-blind trial. They were recruited from new patients presenting for interventional pain management. All patients were informed of the IRB approved protocol and all patients signed the informed consent. The informed consent and IRB approved protocol also described the withdrawal process. Of the 120 patients participating in the study, 60 patients were allocated to each group with Group I patients receiving cervical interlaminar epidural injections of local anesthetic with 5 mL of 0.5% preservative-free lidocaine and Group II receiving cervical interlaminar epidural injections with lidocaine 0.5%, 4 mL, mixed with 1 mL or 6 mg of nonparticulate betamethasone with a total of 5 mL of injectate. All patients with axial pain or those without a definite diagnosis of disc herniation, spinal stenosis, spondylosis, or radiculitis underwent controlled comparative local anesthetic blocks to exclude facet joint pain [6,24,49,50]. Prior to subjecting them to controlled comparative local anesthetic blocks, data on all patients were assessed using demographic data, medical and surgical history with coexisting disease(s), radiologic investigations, physical examination, pain rating scores using the numeric rating scale (NRS) scale [51,52], work status, opioid intake, and functional status assessment by the Neck Disability Index (NDI) [53,54]. Information was also obtained in reference to drug therapy and conservative management as well as all other failed treatment modalities . Only patients without disc herniation, radiculitis, spinal stenosis, spondylosis, and those who were judged to have negative cervical facet joint pain by means of controlled, comparative local anesthetic blocks were included. Patients must have been over 18 years of age, with chronic function-limiting neck pain with or without upper extremity pain of at least 6 months duration, have failed conservative management including drug therapy, physical therapy and structured exercise programs, and have the ability to understand the study protocol and provide voluntary, written, informed consent. Any patient with cervical disc herniation, radiculitis, spinal stenosis, significant spondylosis, uncontrollable or unstable opioid use, uncontrolled psychiatric disorders, and uncontrolled medical illness (acute or chronic) were excluded from the study. Furthermore, any patients with medical conditions or abnormalities which could interfere with the interpretation of outcome assessments, pregnant or lactating women, and those with a history of or potential for adverse reaction(s) to either local anesthetic or steroids were also excluded. All patients underwent diagnostic facet joint nerve blocks. They were performed on 2 different occasions utilizing short-acting and long-acting local anesthetics, specifically 0.5 mL of 1% preservative-free lidocaine on the first occasion, and 0.5% preservative-free bupivacaine on the second occasion. The patient's response was considered positive if pain relief lasted for more than 2 hours following the lidocaine injection and lasted at least 3 hours or more or longer than the duration of relief with lidocaine when bupivacaine was used, plus the ability to perform previously painful movements [6,24,49,50]. After the initial process and enrollment, cervical interlaminar epidural injections were performed under fluoroscopy in a sterile operating room with patients in the prone position, with intravenous access and sedation as medically necessary with appropriate monitoring by one physician (LM). The epidural space was identified in all cases using the loss of resistance technique with intermittent fluoroscopic visualization. The entry into the epidural space and appropriate positioning of the needle was confirmed with an injection of nonionic contrast medium, generally entering the epidural space from C7-T1 to C5-C6. After the confirmation of the appropriate location of the epidural space, each patient was injected with 5 mL of solution that was identical in both groups and consisted of 5 mL of preservative-free lidocaine hydrochloride in Group I and 4 mL of preservative-free lidocaine mixed with 6 mg of nonparticulate betamethasone for a total of 5 mL of injectate in Group II. Even though the protocol did not specify physical therapy, occupational therapy or drug therapy, all patients were provided with a structured exercise program, along with the continuation of conservative management with drug therapy, as well as continuation of work if they were already working. Repeat cervical epidural injections were provided when increased levels of pain were reported along with the deterioration of pain relief, along with the deterioration of functional status to below 50%. A patient was unblinded if an emergency situation arose or if they requested to be unblinded. Those patients who were nonresponsive to epidural injections continued with conservative management and were followed without further epidural injections, with only medical management, unless they requested unblinding. This assessment was designed to evaluate the effectiveness of cervical epidural injections with or without steroids for managing chronic recalcitrant neck pain with or without upper extremity pain diagnosed as discogenic pain without disc herniation, radiculitis, spinal stenosis, or facet joint pain. Outcome measures included NRS, NDI, work status, and opioid intake in terms of morphine equivalence, assessed at baseline and at 3, 6, 12, 18, and 24 months following the treatment. The primary outcome was defined as at least 50% pain relief associated with 50% improvement in functional status measured by NDI. The NRS and NDI have been shown to be valid and reliable in patients with mechanical neck pain [51-54]. Furthermore, the significant improvement utilized in this study is a robust measure in contrast to generally utilized measures of 20% to 30% measurable difference in outcomes [56-58]. Opioid intake was assessed in terms of morphine equivalence after converting dosages from various types of opioids . All patients enrolled were categorized into different employment categories. Patients unemployed or employed on a part-time basis with limited or no employment due to pain were classified as employable. Consequently, patients who chose not to work, were retired, or were homemakers (not working but not due to pain) were not considered to be in the employment pool. The sample size was calculated based on previous studies as well as significant pain relief. In calculating the sample size, a 0.05 two-sided significance level, a power of 80%, and an allocation of 1:1 was considered . An allowance was also considered for a 10% attrition-noncompliance rate. Thus, while 55 patients in each group were estimated to be necessary, 60 patients were required. Of the 120 patients willing to participate, 60 patients were randomly assigned into each group. Random allocations sequence by simple randomization by computer-generated sequences was utilized. Multiple precautions were observed in order to maintain allocation concealment. Randomization was not revealed to the patient, to the physician performing the procedure or to any others involved in the care of the patients. Identical drugs were prepared by one of 3 coordinators and information was not provided to any others participating in the care of the patients. One of the 3 coordinators also randomized the patients into 2 groups. Appropriate blinding or masking was achieved in both groups throughout the study period. Group assignments were random and were not revealed to any of the caretakers. Both solutions were clear so as to not identify the group assignment. In addition, all patients in the study were mixed with other patients receiving routine treatment without informing the physician performing the procedure of the inclusion of the patients either in the study or their randomization status. The statistical methods included chi-squared statistic, Fisher's exact test, t-test, and paired t-test. In this analysis, the chi-squared statistic was used specifically to test the differences in proportions, whereas results were considered statistically significant if the P value was less than 0.05. Further, Fisher's exact test was used whenever the expected value was less than 5 and a paired t-test was used to compare the pre-treatment and post-treatment results of average pain scores and NDI measurements at baseline versus 3, 6, 12, 18, and 24 months. The t-test was performed for comparison of mean scores between groups. An intent-to-treat analysis was performed utilizing either the last follow-up data or initial data for patients who dropped out of the study and for whom no other data were available. A sensitivity analysis was performed utilizing best care, worst care, and lost follow case scenario. Figure 1 illustrates the patient flow. The recruitment period lasted from August 2007 to June 2010. Baseline demographic data are summarized in Table 1. There were no significant differences among the groups, with the exception of weight with Group I patients weighing more than Group II patients. Epidural entry into the intervertebral spaces was 33% between C7 and T1, 58% between C6 and C7, and 9% between C5 and C6. Therapeutic procedural characteristics are shown in Table 2. There were no significant differences noted in average pain relief per year, with an average relief of 66.5 ± 35.0 weeks in Group I and 68.3 ± 33.6 weeks in Group II at the end of 2 years. The total number of injections per 2 years was 5.7 ± 2.4 in Group I and 5.8 ± 2.3 in Group II. At the end of one year, the total number was 3.6 ± 1.1 in Group I and 3.6 ± 1.0 in Group II. After the separation of patients into successful and failed groups, the number was slightly higher at the end of one year as well as at the end of 2 years; however, total relief also increased in the successful group, 73.3 ± 29.6 weeks in Group I and 71.2 ± 31.2 weeks in Group II at the end of 2 years. This was also different at end of one year with 39.2 ± 13.2 weeks versus 36.4 ± 15.9 weeks in Group I and 37.3 ± 37.7 weeks versus 34.8 ± 16.1 weeks in Group II. Further, the total relief was only 5.2 ± 8.4 and 0.8 ± 1 week in the failed groups at the end of one year; at the end of 2 years this was 13.2 ± 26.2 in Group I and 0.8 ± 1.0 in Group II. Schematic presentation of patient flow at 2-year follow-up of 120 patients. Patients not available for follow-up: In Group I - 2 patients died, 2 withdrew, 5 lost to follow-up, and 1 developed MRSA due to unrelated surgery. Group II - 3 Lost to follow-up or moved away, 1 was discharged due to drug abuse; 1 had cardiac problems no treatment; 1 died; 1 was withdrawn. Therapeutic procedural characteristics with procedural frequency, average relief per procedure, and average total relief in weeks over a period of 1-year. Table 3 shows the results of the NRS and NDI scores and the proportion of patients with significant (> 50%) pain relief in each category at baseline as well as at 3, 6, 12, 18, and 24 months. No significant difference was seen between the groups, although there was a significant difference between the baseline and various follow-up periods in each group. Significant improvement as defined by pain relief and functional status improvement of 50% is shown in Figure 2. This figure also shows improvement as assessed in all patients, the successful group, and the failed group. Patients reporting at least significant improvement for 3 weeks with the first 2 procedures were considered to be in the successful group, whereas, all others were included in the failed group. Overall, improvement was seen in 73% in Group I and 70% in Group II at 2 years; whereas in the successful group the improvement was 78% in Group I and 75% in Group II. Table 4 shows employment characteristics in both groups. Overall there were a total of 17 patients in Group I and 25 patients in Group II eligible for employment. The employment total increased from 11 to 14 in Group I, and from 14 to 18 in Group II at the end of 2 years. Table 5 illustrates opioid intake. There was no significant difference among the groups, although there was a significant decrease from baseline to all follow-up points in Group I only. As shown in Table 6, there were no significant patterns of change in weight noted among the groups or from baseline to follow-up periods. Overall, at the end of 2 years, 45% of the patients in each group lost weight, 17% in Group I and 10% in Group II had no change in weight, and 38% in Group I and 45% in Group II gained weight. Of the 688 cervical epidural procedures performed, 6 subarachnoid punctures, 10 intravascular penetrations, and 3 nerve root irritations were observed without long-term sequelae. All patients experiencing transient nerve root irritation were given dexamethasone 8 mg intravenously. No postoperative headache was reported after subarachnoid punctures. Proportion of patients with significant reduction in Numeric Rating Score and Neck Disability Index (>= 50% reduction from baseline). Comparison of Numeric Rating Scale (NRS) for pain and Neck Disability Index (NDI) score summaries at 6 time points. Percentages in parenthesis illustrate proportion with significant pain relief (≥ 50%) from baseline. * indicates significant difference with baseline values (P < 0.01) within the group. # Group by Time Interaction - There was no significant difference between groups at 3 months, 6 months, 12 months, 18 months and 24 months. Opioid intake (morphine equivalence mg). * indicates significant difference with baseline values in group I (P < 0.01). Characteristics of changes in weight. The 2 year results of this randomized, double-blind, active control trial, assessing the effectiveness of cervical interlaminar epidural injections with local anesthetic with or without steroids in recalcitrant axial or discogenic pain without disc herniation, radiculitis, spinal stenosis, or facet joint pain, showed significant, clinically applicable results in interventional pain management settings. This assessment showed significant improvement, with improvement in pain relief and functional status of 50% or more observed in 73% of patients receiving local anesthetic only and in 70% of patients receiving local anesthetic with steroid at the end of 2 years. Furthermore, in the successful group with at least 3 weeks or relief with the first 2 procedures, significant improvement was seen in 78% in the local anesthetic group and in 75% in those patients who received local anesthetic and steroids. Overall, the average number of procedures per year was 3.6 at the end of the first year and 5.8 at the end of the second year with an average duration of total relief per year of 66.5 ± 35.0 weeks in Group I and 68.3 ± 33.6 weeks in Group II over a period of 104 weeks. In the successful group, the average total relief for 2 years was 73.3 ± 29.6 weeks in Group I with local anesthetic only and 71.2 ± 31.2 weeks in Group II with steroids. More importantly, there was no significant difference among the patients receiving local anesthetic only compared to those receiving steroids also. Both groups showed similar results in reference to significant improvement (50% pain relief and improvement in functional status). The results were similar to the one year follow-up of this study and the results of a similar study of the lumbar spine [40,41]. The results were also superior to lumbar and cervical spine disc herniation patients in even though lumbar spine improvement was better in the steroid group [14,38,39]. The results were superior to those of patients receiving either local anesthetic alone or with steroids in spinal stenosis and post-surgery syndrome in the cervical and lumbar spine [43-46]. The paucity of literature with respect to epidural injections in managing axial or discogenic neck pain continues, as this is the only trial . Studies performed in contemporary interventional pain management settings with appropriate assessment, proper design including the proper definition of placebo, performed under fluoroscopy with the repeat of injections as necessary at appropriate intervals are very few. There have been numerous published studies evaluating the role of cervical epidural injections performed without fluoroscopy. The importance of fluoroscopy and the nature of the setting where they are performed including contemporary interventional pain management settings, as well as selection criteria, have demonstrated, yielding superior results. Without fluoroscopy, the delivery of the injectate is not ceratin [61-66]. In addition, this study also provides an insight into the selection of patients with identifying successful or failed groups based on positive results. Even though multiple complications have been reported with cervical epidural injections, these complications are infrequent. Major complications are rare with fluoroscopically guided interlaminar cervical epidural injections [67-75]. Reports of complications with transforaminal epidural injections have been significantly higher and devastating and the conclusions lack proven clinical superiority [76-85]. Factors related to vasculature and discontinuity in the ligamentum flavum may contribute to an increased level of complications in the cervical spine compared to the lumbar spine [86,87]. While the underlying mechanism of action of epidurally administered local anesthetics and steroids is not clear, it is believed to be due to the antiinflammatory properties of corticosteroids [88-98]. The evidence also indicates, however, that local anesthetics may have a similar effect to that of steroids [37,97-104]. Furthermore, there is abundant literature based on clinical and experimental evidence that local anesthetics and steroids may provide long-term relief, often equally individually [6,10-15,25,38-46,97-104]. As with all trials, this trial has multiple strengths and limitations. The strengths include the study being a practical clinical trial conducted in a private practice setting, with inclusion of fairly large number of patients and an active-control design. Furthermore, this study was performed under fluoroscopy with repeat interventions provided only upon the return of pain and deterioration of functional status. In an era of comparative effectiveness, evidence-based medicine, and a cost-conscious environment [105,106], the current trial, even though limited to a single center, provides evidence generalizable to contemporary interventional pain management settings. Various measures have been undertaken to ensure proper patient selection, including only selecting patients with axial neck pain without facet joint pain, disc herniation, radiculitis, and spinal stenosis. Consequently, this study is typical of a practical clinical trial with an active-control group instead of a placebo-controlled trial. These types of trials in contemporary medicine are more effective in providing value-based interventional pain management . Limitations include the lack of a placebo group. Having a placebo group, by design, with the appropriate inclusion of an injection of a placebo solution into a nonactive structure, has been debated [6,10,107-115]. Placebo interventions have been misinterpreted based on the solution injected and the location of the injection, with some even interpreting local anesthetic injection as placebo, not realizing the inactive substances injected into active structures invariably result in a multitude of effects, with the majority of them being therapeutic [116-119]. The effects of placebo, nocebo, Hawthorne effect, natural course of the disease which is not applicable in these chronic patients, and regression to mean have been extensively discussed in reference to placebo, nocebo, and pure, impure, and fake placeboes [120-123]. The only appropriate placebo designs reported in interventional pain management were those of Ghahreman et al  and Gerdesmeyer . These trials showed that when proper placebo design is achieved with injection of an inactive solution into an inactive structure, it is not only considered as true placebo, but that the results are striking in the treatment groups. In addition, the other limitation in this study includes the higher weight of patients in Group I compared to that of Group II; however, this appears to have not resulted in any significant difference among the groups. The implications of this trial for health care are enormous in an era of health care costs that have spiraled out of control, resulting in numerous public policies and restrictions on the provision of care . Thus, it is crucial that accountable interventional pain management include performing trials with appropriate methodology in practical settings. This promotes accountable interventional pain management with an improvement in patient care without curtailing patient access and assists in curbing health care costs. In fact, this is the opposite of the inappropriate utilization of health care resources and provides the necessary appropriate information for shared decision making to patients presenting into similar settings. The 2-year follow-up of this randomized, double-blind, active control trial of 120 patients with chronic function-limiting axial or discogenic pain managed with fluoroscopically guided cervical epidural injections with local anesthetic with or without steroids showed effectiveness in 71% of patients. This trial also showed improvement in pain and functional status requiring an average of 6 procedures over a period of 2 years with relief for 72 weeks over a period of 2 years in the successful group. The authors wish to thank Alvaro F. Gómez, MA, and Laurie Swick, BS, for manuscript review, and Tonie M. Hatton and Diane E. Neihoff, transcriptionists, for their assistance in preparation of this manuscript. Corresponding author: Laxmaiah Manchikanti, M.D. 2831 Lone Oak Road, Paducah, Kentucky 42003, Phone: 270-554-8373 ext. 101, Fax: 270-554-8987 E-mail: drlmcom.